Accidents Blight Oschersleben WTCC. (Rounds 15 & 16), 25th/26th August 2007. A superior drive by Rob Huff in the second race of the Oschersleben round of the World Touring Car Championship turned out to be the highlight of an accident-marred weekend. 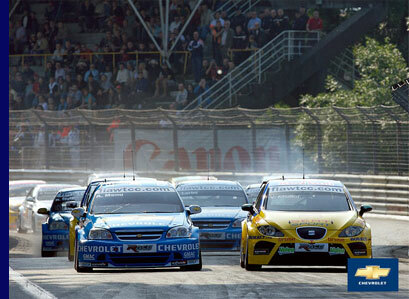 The most important – and innocent – victims of the incidents at the start of both races were Alain Menu and Nicola Larini, Chevrolet’s best-placed drivers in the Drivers' Championship standings. The positive outcome of this weekend is that both Menu and Larini will lose ballast weight for the next round at Brands Hatch. At the same time, but on the Nürburgring, Spanish Chevrolet Lacetti driver, Maria De Villota, scored her first win of the season in the German Touring Car Championship, having already finished second in the first of the weekend’s two races. 1. BMW, 204pts; 2. SEAT, 175; 3. Chevrolet, 150; 4. Alfa Romeo, 85. The next race of the 2007 World Touring Car Championship takes place at Brands Hatch in the UNited Kingdom on 23rd September.